Bold jackets are fun. Bold tweed jackets are funner. After writing about the first few odd jackets I bought, I’m glad I’ve come to a point in my wardrobe where there is a justifiable (ha!) gap that can be filled with loud, patterned jackets. As spring approaches, I wanted to write something about this one before I reluctantly put it away until fall. This fabric from Abraham Moon & Sons popped up last year from a number of makers, and I fell in love. 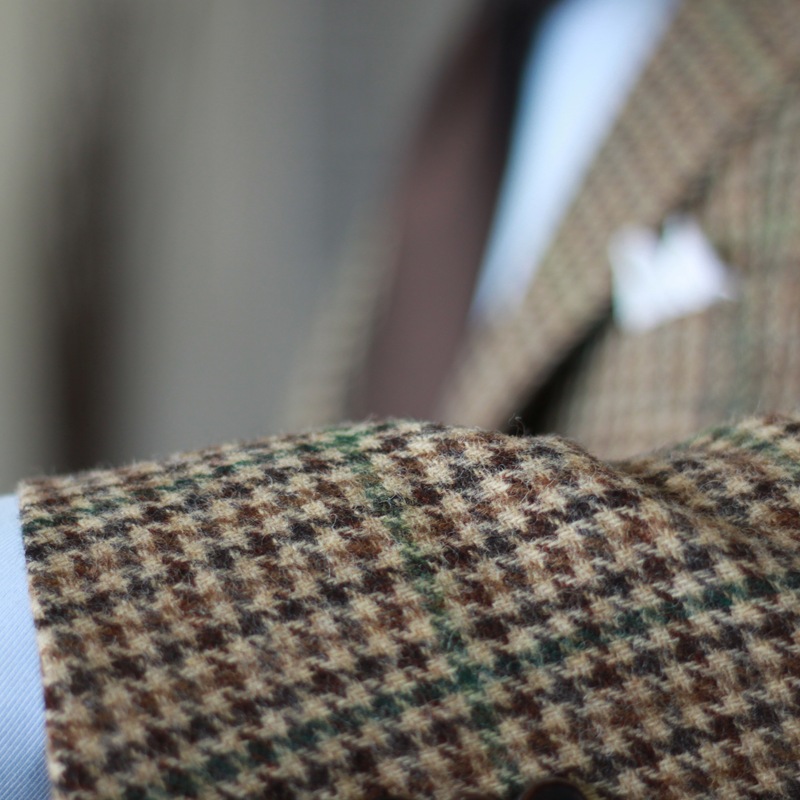 To me, it is the quintessential tweed – earthy colours, oodles of texture, and a bold pattern. Luckily, my go-to guys at Spier & Mackay had secured some of the fabric, and would be making up a limited batch in their Neapolitan cut (perfect). I placed my order the day they went on sale, and when it showed up a few days later I was quite pleased – I did end up sizing up to a 44R on this one, as the fabric is quite thick and spongy. The great thing about this jacket is that it can easily be dressed up and down. Jeans, OCBD and tweed? Win. Dress shirt, flannel trousers and a tie? Win. 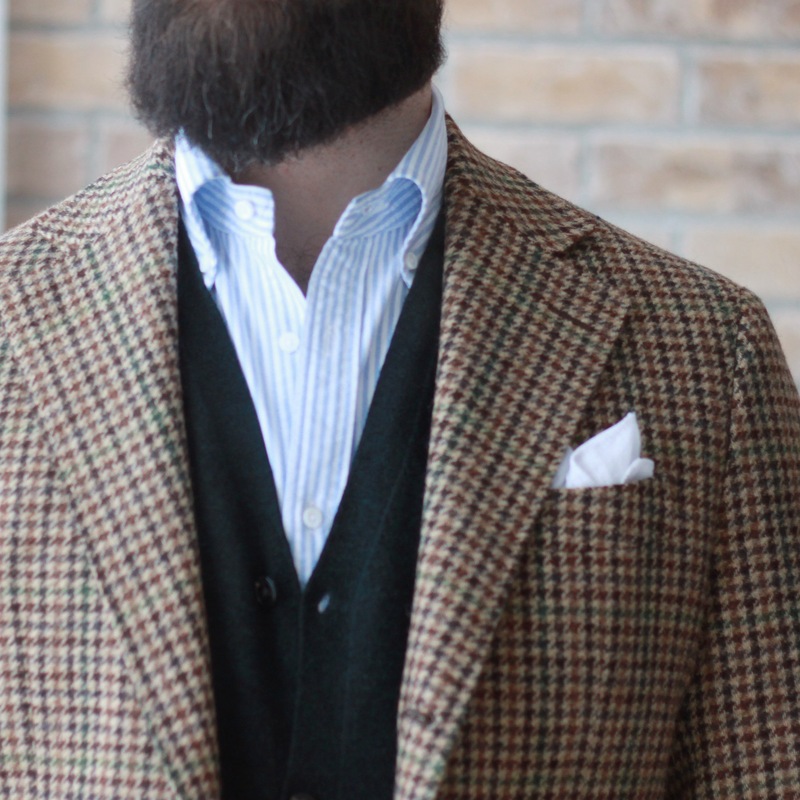 There is something about the bold tweed jacket that is special. I think the texture of the fabric being so rustic and raw subdues the in-your-face aspect of the pattern. 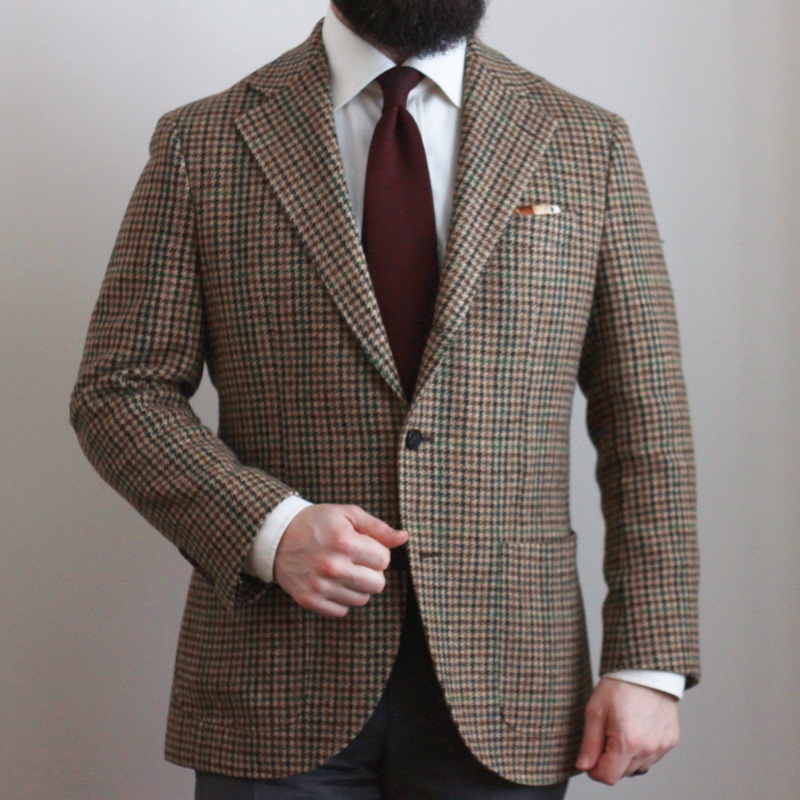 As versatile as I feel this jacket to be, it is a bold tweed that features colours that were initially tricky to pair. The lighter oatmeal coloured base means that many trousers will be darker. This is lovingly referred to as a “northern lights” look on style forum. Here I’m wearing it with dark brown trousers. With the green checks in the jacket I tend to reach for green ties. It’s an easy combo to reach for, but I’m trying to challenge myself a bit more now. The blue shirt I chose is a bit too saturated, but worked ok. Safely playing with the colours in the check, I chose a square with a creamy base featuring spots of green and brown. 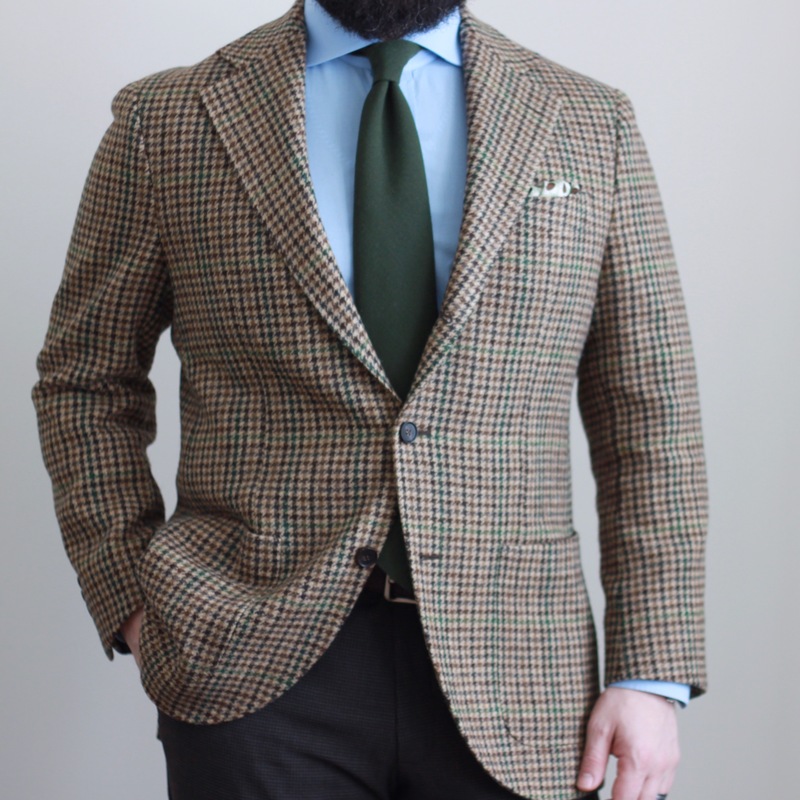 This go around, I wanted to see how I could pair this bold tweed jacket without using browns and greens in my accessories. I think it worked really well. 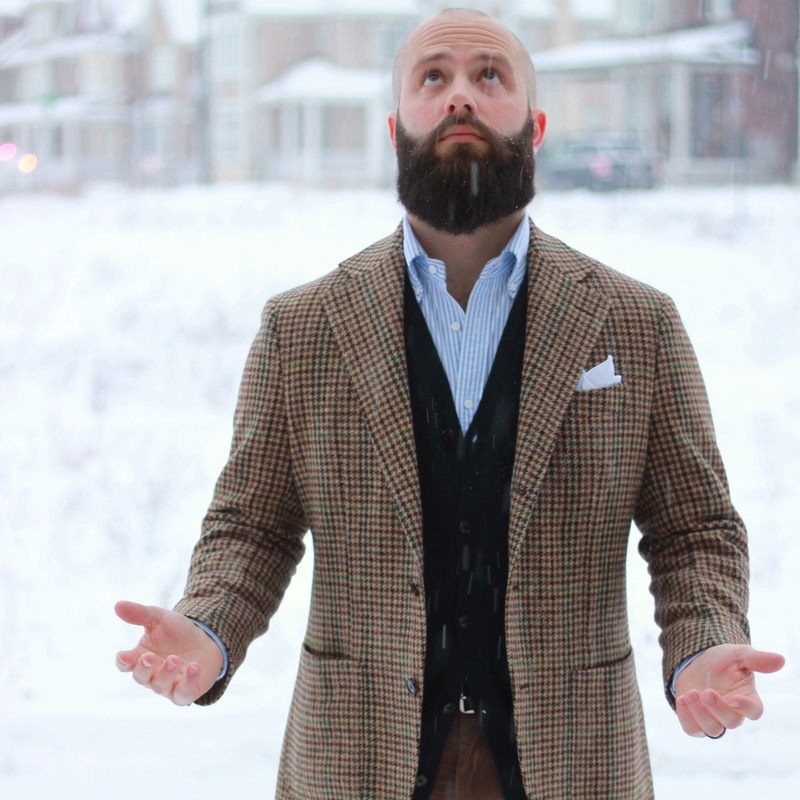 I’ve written about the benefits of the ecru dress shirt, and this is a great example. I think of it as a warm white. As a backdrop for the tie, it gives the burgundy an earthier, brown cast that helps it fit in with the jacket. The mid grey trousers are a bit warm in colour on their own, and so fit well with the rest of the pieces. Back to the safe play – this time I went a little more conservative with the pairings, and chose my olive zig zag knit tie from Oxford Rowe (reviewed here). I actually selected this tie for the review thinking it would pair well with this jacket. The subtle texture of the zig zag knit works really well in conjunction with the fuzzy, bold tweed pattern and the olive colour compliments both the greens and browns in the jacket. The shirt is a pale blue end on end, and I’ve worn a pair of light grey trousers. The last piece is the Kent Wang Taurus Orion pocket square. I don’t think this was the right choice here. It’s got olive, gold and yellow in it, but doesn’t provide any real contrast. 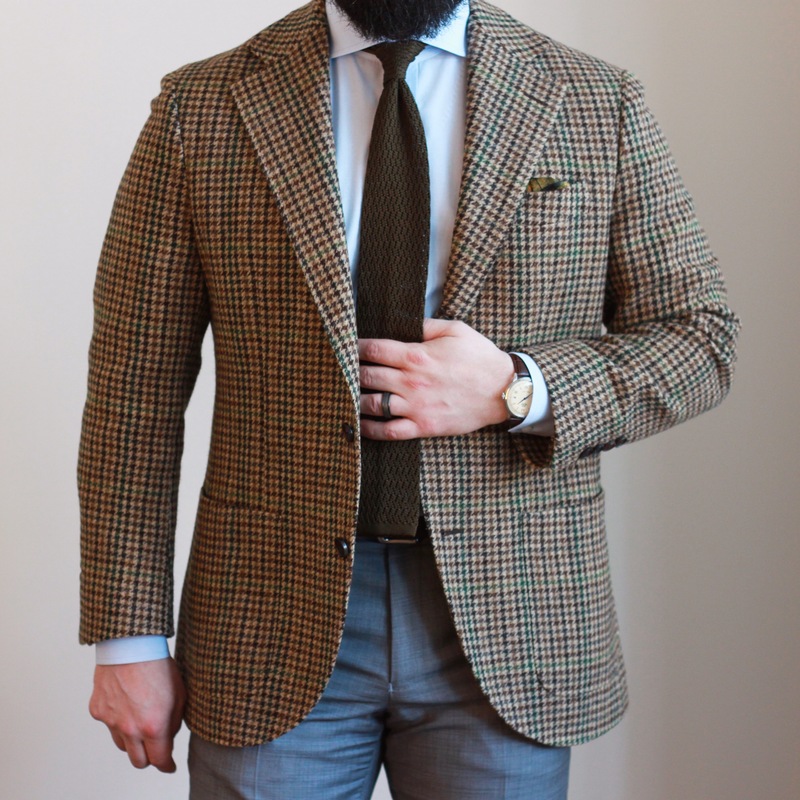 This bold tweed jacket is perfect for casual outfits. Here, I’ve paired it with coffee brown chinos, a light blue striped OCBD and a forest green cardigan. Capping it off is a plain white pocket square. Overall this outfit works, though I do feel that the white square is a bit stark in contrast to the rest of the pieces. If all this doesn’t sell you on the bold tweed jacket, I don’t know what else to say. This fabric in particular is truly something special. I’m planning to squeeze in a few more wears before it gets too warm. Thanks for reading!